Kabul (AFP) – Gunmen stormed a luxury hotel in Kabul and killed at least 18 people, most of them foreigners, sparking a 12-hour battle with Afghan forces backed by Norwegian troops that left terrified guests scrambling to escape. 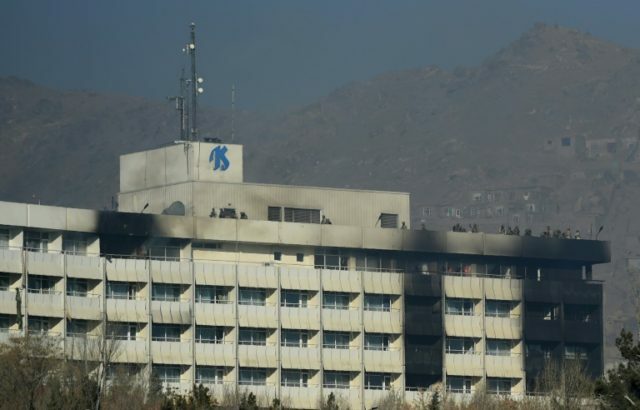 Several Ukrainians were among those killed in the Taliban-claimed assault on the six-storey Intercontinental Hotel in the Afghan capital, Ukrainian foreign ministry official Vasyl Kyrylych confirmed to AFP, adding that more information would be released Monday. Afghan interior ministry spokesman Najib Danish said 14 foreigners were among the dead, but did not specify their nationalities, in comments to Afghanistan’s Tolo News hours after the overnight attack that ended Sunday. Terrified hotel guests climbed down bedsheets tied to balconies to escape the gunmen rampaging through the hilltop hotel overlooking the Afghan capital. One lost his grip and fell in Tolo News television footage, which also showed black smoke and flames billowing from the hotel. Special forces were lowered by helicopters during the night onto the roof of the landmark 1960s building. Afghan security forces killed all six attackers, the interior ministry said. They were aided by Norwegian troops, Norwegian military officials told public broadcaster NRK. Norway has helped train Afghan elite forces since 2007. “I want to say this explicitly and frankly and precisely… in total 14 foreigners and four Afghans were martyred in the attack on the hotel,” Danish said on Tolo, adding that more than 160 people had been rescued during the attack. Afghan officials have been known to understate death tolls in high-profile attacks. Danish also said preliminary information showed the attackers may have already been inside the hotel before launching the assault, but gave no further details and warned an investigation had to be carried out. But he did say that among the dead were 11 people from Afghan airline Kam Air. The airline’s CEO, Captain Samad Usman Samadi, earlier said 42 of its personnel had been at the hotel during the attack — at least 16 of whom were still missing. “We fear for their lives,” he told AFP. The Taliban claimed responsibility for the assault via email. The attack followed security warnings in recent days to avoid hotels and other locations frequented by foreigners in war-torn Kabul. “We are hiding in our rooms. I beg the security forces to rescue us as soon as possible before they reach and kill us,” one guest, who did not want to be named, told AFP by telephone during the siege. His phone has been switched off since then. Officials said four gunmen burst into the hotel, which is not part of the global InterContinental chain, on Saturday night, opening fire and taking dozens of people hostage. Afghan Telecom regional director Aziz Tayeb, who was one of dozens of people at the hotel attending an IT conference, said he saw the attackers enter. “Everything became chaotic in a moment. I hid behind a pillar and I saw people who were enjoying themselves a second ago screaming and fleeing like crazy, and some of them falling down, hit by bullets,” Tayeb told AFP. Local resident Abdul Sattar said he had spoken by phone to friends who are hotel staff and had been trapped inside. “Suddenly (militants) attacked the dinner gathering… (then) they broke into the rooms, took some people hostage and they opened fire on some of them,” he told AFP. Rahimi said the attackers were armed with light weapons and rocket-propelled grenades when they stormed the hotel. Security in Kabul has been ramped up since May 31 when a massive truck bomb killed some 150 people and wounded around 400 — mostly civilians. But the resurgent Taliban and Islamic State are both scaling up their assaults on the city. The attack on the Intercontinental was just one of several bloody assaults Sunday. In a village in the northern province of Balkh, Taliban militants went from house to house in the middle of the night, pulling police from their homes and shooting them dead. At least 18 officers were killed, deputy police chief Abdul Raziq Qaderi told AFP. In Herat in the west at least eight civilians were killed when a car hit a Taliban-planted roadside mine, officials there said. The last major attack on a high-end hotel in Kabul was in March 2014 when four teenage gunmen raided the Serena, killing nine people including AFP journalist Sardar Ahmad. In 2011 a suicide attack claimed by the Taliban killed 21 people at the Intercontinental including 10 civilians. Danish said authorities were probing how the attackers got past the hotel’s security, which was taken over by a private company three weeks ago. “We will investigate it,” he said. A hotel employee told AFP that as he fled the hotel he saw the new security guards running for their lives. “They didn’t do anything, they didn’t attack. They had no experience,” the man said on condition of anonymity.